A few years ago, I was flown to CES by SamSung to talk about their new camera. That was definitely a geek dream come true. But never in a million years would I expect my art would be featured by Gizmodo, the hub of all geekdom! It's a big deal because it puts drag in front of people who don't belong to the LGBTQ community, and those who don't watch Drag Race. 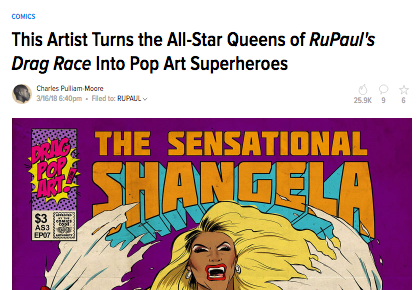 It's a big deal because I never thought my love of comics & drag queens could ever bring people together. I feel so honored!